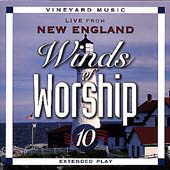 Live From New England: Vineyard Music EXTRA! For years, the Spirit has been moving, touching, and embracing the people of New England. The grace poured out through Jesus Christ is overflowing in all our hearts. This album captures only but a glimpse of the shouts of gratitude and praise to a God that spared no expense to save our souls. When I first listened to You Are God on the Touching the Fathers Heart series, I felt the song lacked a little zeal. But after giving it another try on the Winds series, I immediately felt the simple but powerful reverence for God. Scott Underwood also leads the other songs such as Come and Fill Me Up  and Whatever Is True . He also does an outstanding jazzing up oldies. He adds a groovy bass line to You are the Vine and a modern yet humble version of the hymn Blessed Assurance . Cindy Rethmeier s Abba Father  and Your Presence  contributes a soft and genuine touch to the album along with an Alleluia, He Is Coming  which conveys the reality and celebration of Christs return. Yes, He is coming! Let s celebrate! NortelX is a freshman at the University of Pennsylvania. Im currently a member of InterVarsity Christian Fellowship. The Lord brought a revival to my heart in freshman year in high school. And Ive been worshipping Him ever since.